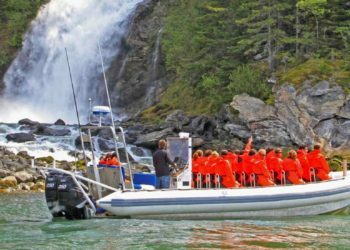 Get behind the controls of a high-powered inflatable Zodiac vessel and head out into Alaskan coastal waters for this ride of a lifetime! This is not paddling a canoe on a quiet lake; things on this adventure tour can get rough and wild! If you’re up for adventure, the Backcountry Zodiac Expedition is the perfect Ketchikan shore excursion for you. Seats are limited, however, and must be booked well ahead, as this tour is highly rated and is extremely popular with thrill-seeking travelers. With a guide leading the way, your pod of 4 four-passenger Zodiacs will cruise out into Ketchikan Harbor exploring remote inlets, tidal pools rich in fascinating marine life, and uninhabited islands clad in dense forest, even as magnificent eagles soar overhead! There are several stopping points along the way to admire the magnificent scenery and wildlife (maybe even whales! ), to take photos, and to give anyone over the age of 25 a chance to take the wheel. The small, maneuverable boats make it possible to get close-in to shore for close-up views of seals and other wildlife. If sea spray and choppy seas don’t daunt you, get ready for a real adventure with one of the most exciting excursions Ketchikan! As with other excursions Ketchikan, all transportation is included in the expedition, with pick-up close to the cruise docks in downtown Ketchikan followed by a short transfer to the launching point for the Backcountry Zodiac Expedition. Here, you’ll be fitted with all the necessary gear to stay warm and dry out on the water, including rain gear, boots, face masks, gloves, PFDs, dry bags for your personal items, and safety glasses. Then it’s into the four Zodiacs for a full-throttle Alaskan outdoor experience like no other! If you love high-speed coastal adventures and are also heading to Juneau, check out our exhilarating Taku Glacier Adventure! The minimum age for this tour is 4 years old. Not recommended for anyone with neck and/or back injuries or expectant mothers., This tour is not suitable for anyone that walks with assistance or for wheelchairs., This tour is not recommended for those with poor physical condition or those who are intolerant or unwilling to get wet or cold. Groups of 2 will be paired with other groups of 2, and groups of 4 will get their own vehicle. Answer: This tour operates rain or shine, and rain is common as we lie in a temperate rainforest! Because you'll be out in the element on this tour, lots of gear is provided to keep you warm and dry. Full rain suits, hats, gloves, boots and dry bags will all be provided at the start of the tour. Feel free to leave anything extra behind for safekeeping during the tour, and come back to it later. Do we need previous experience to drive the boats? Answer: Nope! The zodiac boats are very easy to operate, and you'll receive a full orientation before disembarking. Feel free to trade off drivers at various intervals along the way, so one person can have fun navigating while the others enjoy the scenery. When should I book this tour? Answer: Because of its positive ranking on TripAdvisor and limited availability, this tour fills up quickly! We recommended booking early to ensure your spaces, as you can always cancel up until one week away for a full refund.